Spring brings many emotions and pleasures for each of our 5 senses! Some famous French brands celebrate the season by offering an explosion of visual and olfactive experiences to New Yorkers. 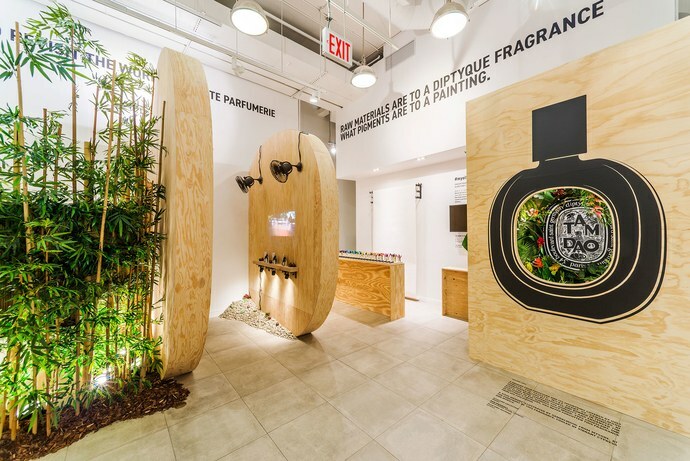 French fragrance brand Diptyque opened a three months pop-up experience in New York's SoHo to celebrate the brand's fifty-year history in personal fragrance. Located at 112 Mercer Street, the pop-up will close its door at the end of the month. The store is filled with testing stations, each with a different emotion and experience. Diptyque stated that its goal with the pop-up is to "draw inspiration from the past, to reinvent the future, to surprise and offer imaginary journeys of the mind and the senses through each of [the fragrance] creations". By visiting the pop-up store you'll indeed travel through countries, smells and experiences while discovering the history and specificities of Diptyque's perfume. Sezane boutique on Elizabeth Street also embellished the City in April with a window full of flowers, adding an even more Parisian touch to its front door. Every month, the store also hosts flower workshops with NYC Flower Girl to learn how to arrange seasonally-themed bouquets.